It has become clear during the past few seasons that, when healthy, Calgary Flames defenseman Mark Giordano is among the best fantasy hockey assets in the League. 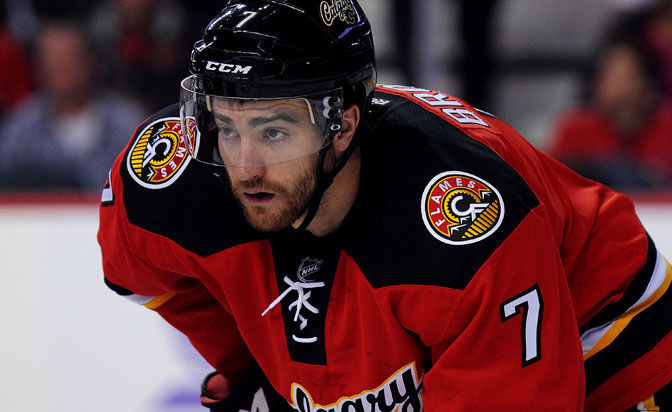 What might not have been as clear is that his partner, TJ Brodie, has become a must-own player in his own right. What started as a whisper with a modest breakout that saw him put up four goals and 31 points last season is becoming a loud roar this season as he is rolling up points with the best of them. Brodie has points in six of his eight games this season and had a six-game scoring streak stopped in the Flames' 2-1 loss to the Tampa Bay Lightning on Tuesday. His seven points are tied for second among all defensemen heading into play Wednesday. He also has a plus-3 rating, has three power-play points and has scored on 17.6 percent of his 17 shots on goal. The 24-year-old has seen his ownership grow to 64 percent in Yahoo standard leagues but he's being ignored in too many. Someone who isn't ignoring Brodie is Flames general manager Brad Treliving, who referred to his defenseman as being a "quiet little secret that only [the Flames] knew about," after signing him to a five-year contract, $23.25 million contract extension on Oct. 20. "I think TJ is getting an understanding about how good he can be," Treliving told the Flames website. "He can be a real good top defenseman in this League. The more that he understands that and trust his abilities and his game ... you just see that confidence and him taking his game to a different level." Treliving said the Flames didn't make the decision to extend Brodie based on his quick start, but rather after considering all variables of his growth, including how he has improved on both sides of the puck. Fantasy owners can make a leap of faith based on a smaller snapshot and that is why you should grab Brodie while you still can. He is averaging a Flames-best 25:14 of ice time per game and three times has gone played more than 27 minutes in a game. All of that ice time has him contributing in all facets of the Flames' game plan. He plays with Giordano at even strength, averages 2:17 per game on the power play and 2:57 per game killing penalties. He doesn't play the most physical game; he has two hits this season. But he isn’t afraid to block shots, with his 18 second among Flames defensemen. The Flames might still have a ways to go before they are contending in the Western Conference, but they are 4-3-1 and Brodie is a big part of the why they have been competitive through the first few weeks of the season. This is a player who can help you today and is an absolute must-own in dynasty or keeper leagues. In 48 games last season Vatanen had 21 points, a plus-9 rating and 73 shots on goal. He is building upon those numbers this season as he's become something of a power-play specialist for the Ducks. He's on the third pairing but is averaging 4:30 of ice time per game with the man-advantage to lead the Ducks. He had two power-play goals Sunday and all five of his points (two goals, three assists) have come on the power play. Those numbers should continue to grow as he gets to spend lots of time on the ice with Ryan Getzlaf and Corey Perry. Vatanen is owned in 42 percent of Yahoo leagues. We still have high hopes for the ninth pick of the 2012 NHL Draft, but with the Jets struggling we have to look in other directions for fantasy production. Trouba isn't getting top power-play time and has zero points, nine shots on goal and a minus-2 rating in six games. His time will come, but for now there are plenty of other options. Del Zotto landed a job with the Flyers after a prolonged wait during free agency and he slowly is working into the mix. He had a three-game assist streak ended in the Flyers' 4-0 loss to the Chicago Blackhawks on Tuesday. He has 10 shots on goal and is averaging 18:47 of ice time per game. He is on the second power-play unit and could earn a bigger role if he keeps producing. He is owned in 15 percent of Yahoo leagues.